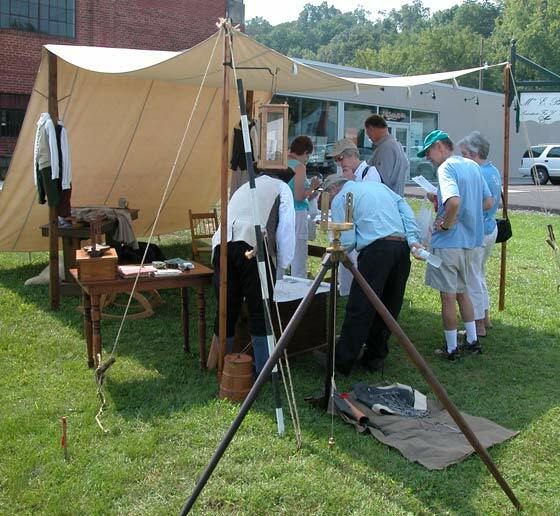 For Hampshire Heritage Days 2007 The Fort Edwards Foundation accepted an invitation from the Loy Foundation to use the Bottling Works in Romney for its event venue. The move has proved very successful. 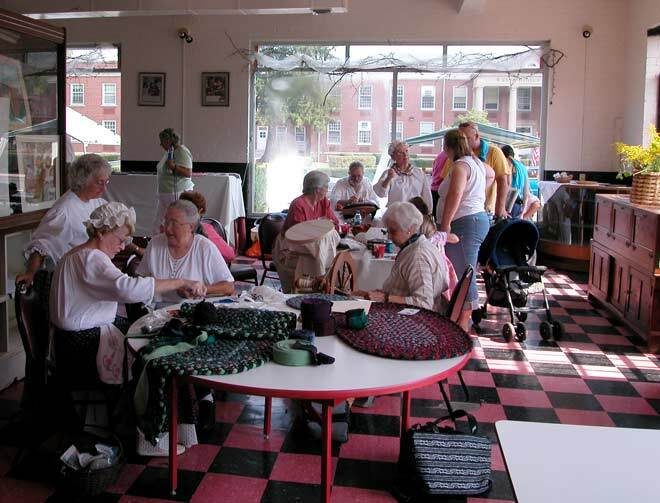 Shown above are the Artisans for Fort Edwards set up on the front room of the building. In the large event room behind presentations were given throughout the day. 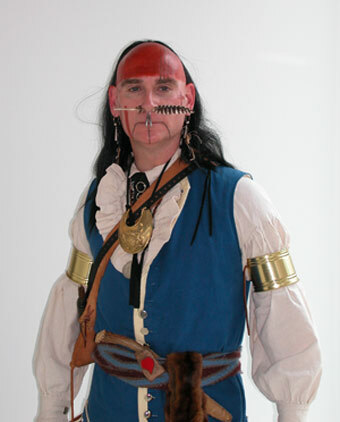 Shown below is the living history presentation of Andrew Montour, the famous Indian interpreter and warrior. At the end of his address Mr. Montour presented the Foundation represented by Mark Jones with a replica medallion that Gov. Dinwiddie had given him in gratitude of his long friendship with the British. 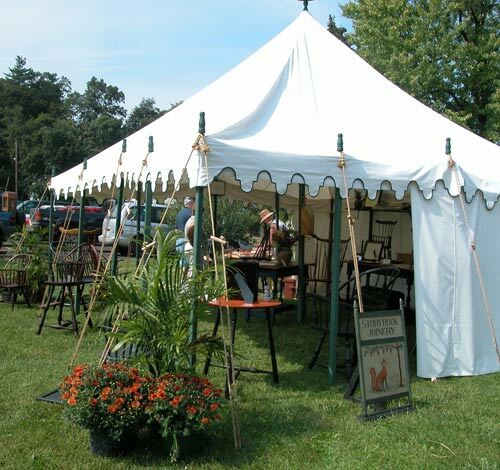 Anne Bailey with stories about frontier living at 11 a.m.
Roger & Turtle Swartz speaking on Indian perspectives at 1 p.m.
Jo Jones on Colonial Clothing at 2 p.m. Conversation with Guyasuta, a Seneca warrior at 2:30 p.m.
William Hunt, Jr. as Andrew Montour (left) and Richard Bower as Guyasuta, a Seneca warrior. 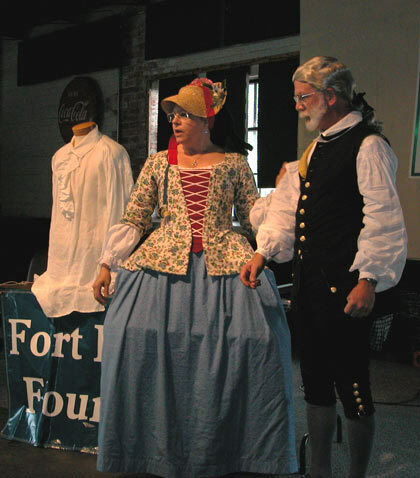 Shown above are (left) Jo and Mark Jones displaying colonial clothing; Jo gave a presentation on making authentic colonial clothing. 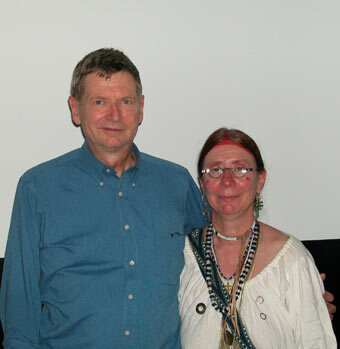 Roger and "Turtle" Swartz (right) gave a presentation on the "skulking way of war" and Indian spirituality and customs. 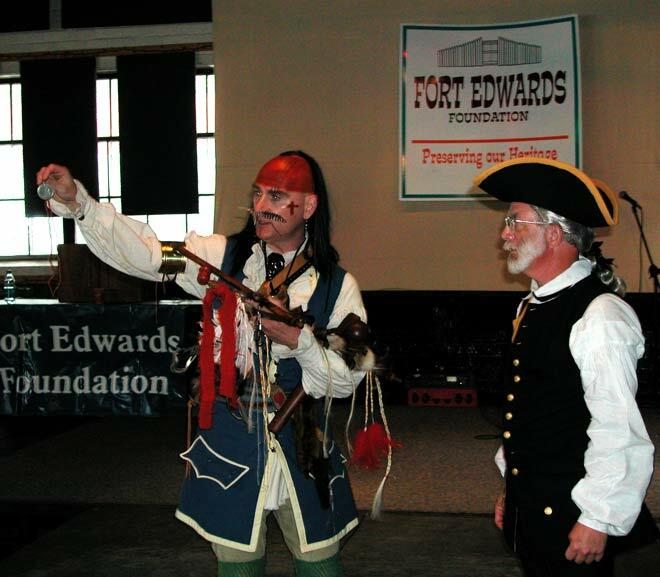 The Fort Edwards Foundation is proud to have been able to finally give some time to present the Native American side of the French and Indian War. After all, it was a conflict involving three nations, not just Britain and France. We thank our presenters, especially the Swartzs who were with us for both our events this year. 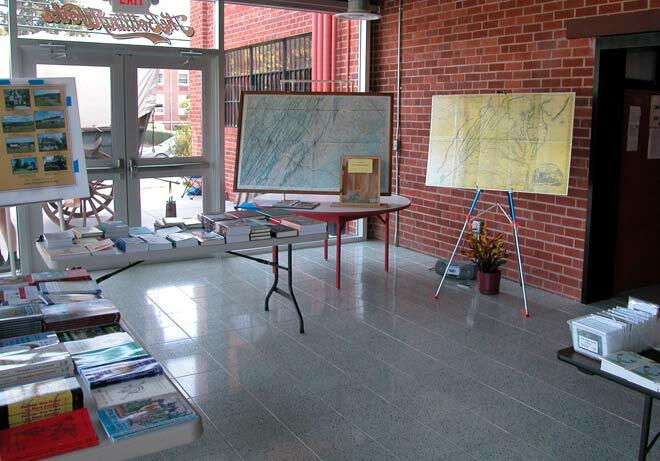 We had a good history display and plenty of books and maps on sale for our visitors. 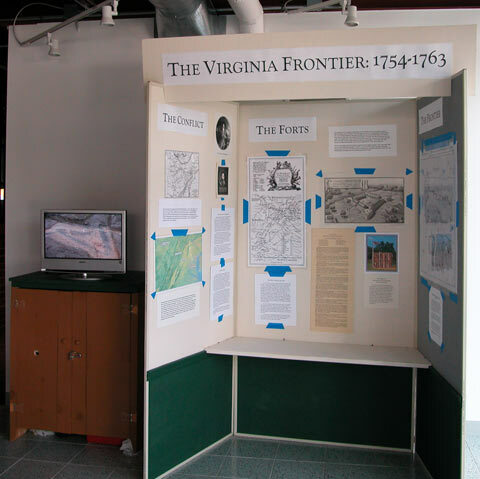 If you look closely at the video monitor on the left which is showing the Introductory Video from the Visitor Center you will see a picture of the excavated bastion in the stockade wall. It is the pointed protrusion in the wall that protects the outside of the wall. 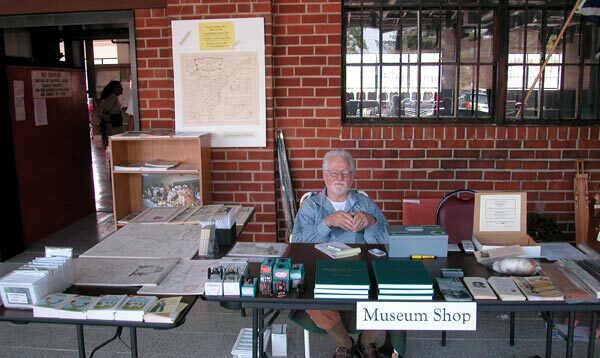 Our Vice-President and Museum Director was on hand with a comprehensive collection of books and maps for sale. 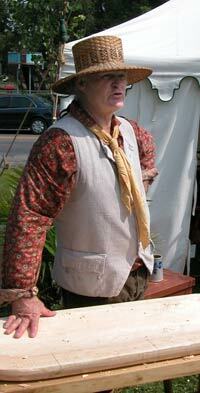 This is a great resource for French and Indian War aficionados. The West Virginia Farm Museum had an informative display. Charles Boland and Storybook Joinery's Windsor chairs Mr. Gary VanMeter explaining the details of early transportation to a captivated audience. 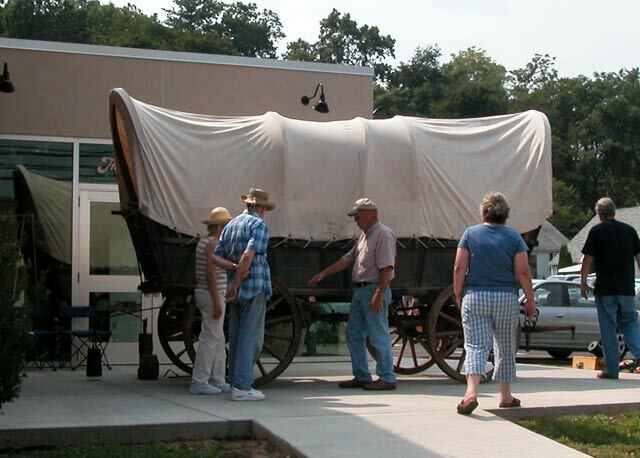 Although the wagon draws immediate attention from our visitors, it is the educational and entertaining talk by this expert that continues to be one of our top features at events. 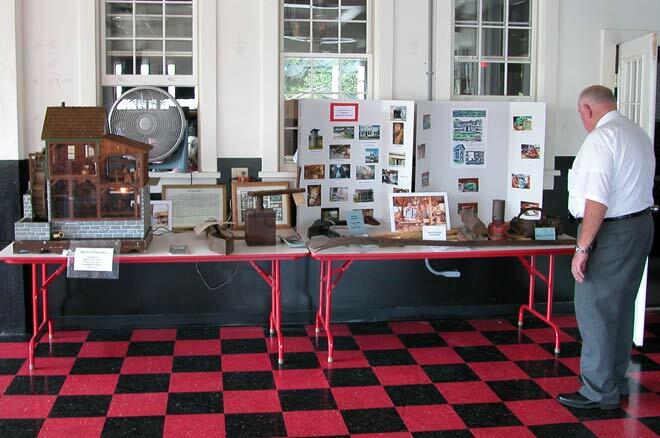 These are two views of the grounds of the Loy Foundation's Bottling Works where we set up our displays. Mr. & Mrs. Parish were on hand to show visitors how Hampshire County and all the land of Lord Fairfax's Northern Neck Proprietary was surveyed into plots for the early settlers. 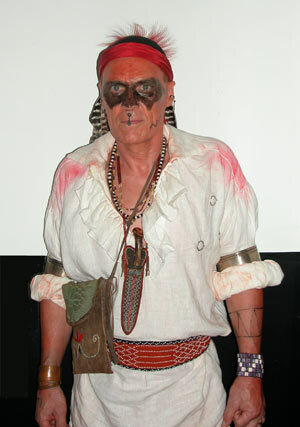 Surveying was a very respectable profession in colonial times. It was the profession that the young George Washington expected to be his life's work until he inherited Mount Vernon from his eldest half-brother, Lawrence. We do not want to give the impression that all of our visitors were this elegantly attired or as charming, but history does bring out some beautiful people. Everyone had a great time. 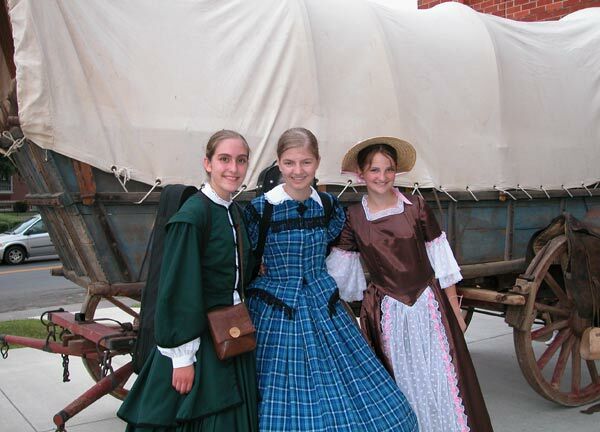 We hope you will put April 19, 2008 on your calendar for the Colonial Feast, our next event. 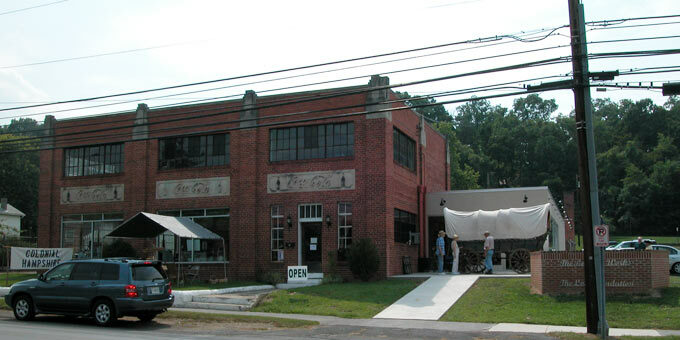 We would like to thank Mr. Bob Mayhew and the folks at the Loy Foundation for inviting us to use their wonderful facility at the old Coke Bottling Works. This is a great example of two private, non-profit foundations joining to provide the community a first class educational opportunity. We look forward to cooperating with the Loy Foundation again in the future.